Home » Plumbing, AC & Electric Tips » Electrical » Electrical Problems: What Is That Buzzing Sound? Residential and commercial property owners should plan for regular maintenance and repairs before any electrical problems become overwhelming and costly. Your electrical system should be checked annually in order to determine if any upgrades are needed to remain up to code (particularly for commercial property) or for needed repairs. It’s a good idea to have a reference spec on hand of your electrical system and circuit breaker panel. 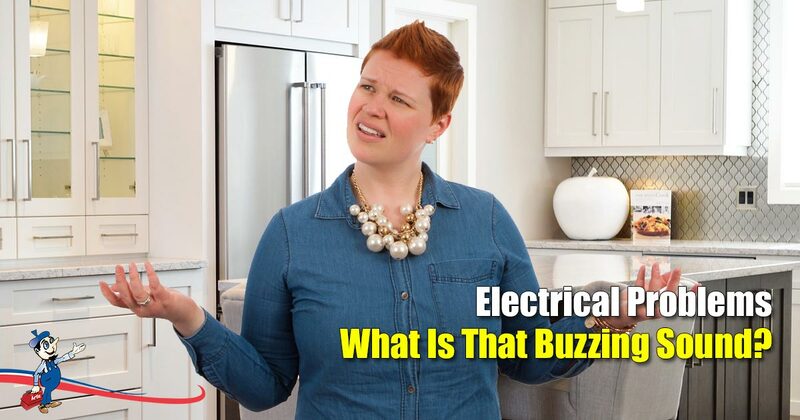 In this article we’ll discuss what a humming or electrical buzzing sound is, how to pinpoint its source, and what further steps you should take by contacting an electrician. There is a term for an electrical buzzing sound which is referred to as mains hum. This is caused by an alternating current at the frequency of the mains. The sound often has substantial harmonic content at 50 / 60 hertz. Most residential systems in the US operate on a standard 60 hertz (the SI unit of frequency equal to one cycle per second). Humming may occur at 60 hertz, but mains hum occurs at higher frequencies such as 120 / 180 hertz. You can hear a mains hum around large appliances in the home such as a refrigerator or other units which operate on a small motor. Buzzing can also occur at a transformer outside your home with the rise of stray magnetic fields. These cause the enclosure of the transformer and its contents to vibrate. At high voltage power lines and street lamps, a hum can be caused by what’s known as a corona discharge. The circuit breaker panel is the distribution point of electricity in your home or business – the main breaker controls power to all other switches. In general, the buzzing of a mains hum can indicate a circuit breaker or wiring problem. Wiring could be damaged from water intrusion, corrosion or in need of replacement and upgrade. Circuit breakers can have an overload of current causing a buzzing sound. Once you determine the source, turn the electricity off and have the breaker replaced. Cross-check wiring at the breaker panel for any defects or damage. Improperly connected wiring can also cause buzzing and sparks. Schedule a comprehensive inspection of your electrical system and circuitry. There could be an anomaly or a leak which is affecting the wiring or breakers. If you have a concern about a persistent buzzing sound or other electrical problems, contact Art Plumbing, AC & Electric. Our technicians are licensed, insured, and state-certified servicing Florida residential and commercial property owners since 1983. We take the worry and work out of your service needs, so you can relax.